Marvel Cinematic Universe: This graph models appearances of superheroes in the Marvel Cinematic Universe movies as of 2018. Meal Ingredients: This graph models occurences of ingredients in popular meals. Participants may submit drawings of both graphs (or only one graph). The Marvel Cinematic Universe is a media franchise and shared universe that is centered on a series of superhero films, based on characters that appear in comic books published by Marvel. The data set describes a selection of 28 characters (heroes) and in which of the 24 movies released so far they appeared. 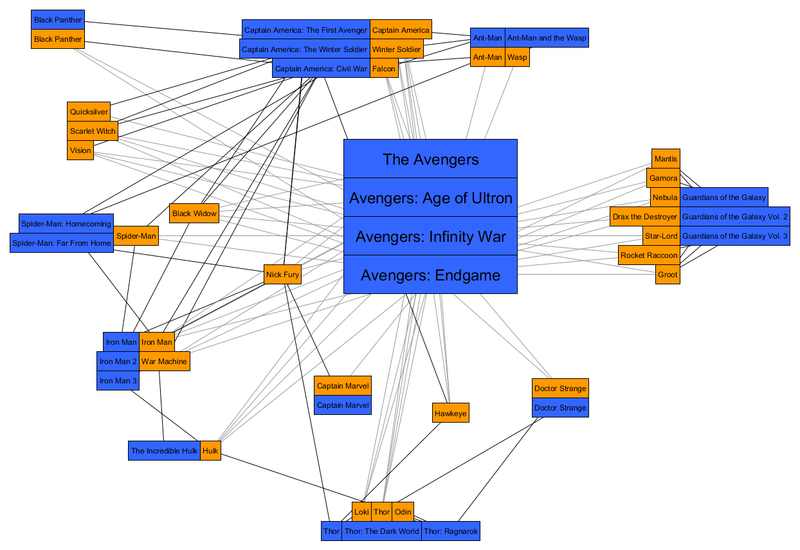 The data was compiled from the Marvel Cinematic Universe Wiki. The graph is provided in GraphML format. Each node has a data key type that describes whether it corresponds to a hero or to a movie, and a data key name that contains the name of the hero or the title of the movie. There is an edge between a hero-node and a movie-node if the hero appeared in the corresponding movie. The data set describes 151 food recipes extracted from the TheMealDB database. TheMealDB was built in 2016 to provide a free data source API for recipes online. TheMealDB originated on the Kodi forums as a way to browse recipes on a TV. The provided data set contains three files. File “ingredients" lists 297 food ingredients, e.g. "Beef","Flour","Red Wine","Onion","Carrot","Thyme",”Mustard". File “areas” contains 11 areas (countries) that are popular for their dishes around the globe: "American”, "British”, "Chinese","French","Greek","Indian","Italian","Japanese","Mexican","Spanish",”Thai”. File “meals” contains 151 recipes. Each record contains the following properties. category (Optional) The category to which the meal belongs. The list of ingredients in the meal. All the ingredients used in this field can be found in the file "ingredients". name Name of the meal. area Area where the meal is originating from. All the areas are listed in the file "areas". The task is to visualize the data either in a form of a graph or any other form the authors prefer. The authors can decide whether they omit relatively uninformative parts of the data and the optional field "category", and should outline their decisions in the submission. For the creative topics, you are completely free to use any drawing style you wish. Your submissions will be judged both on aesthetic value and on the clarity of information displayed. (Optional) A link to a visualization illustrating the graph in a format of your choosing (e.g., an interactive tool). (Optional) A link to a web-friendly image of your visualization, max resolution 1000 by 1000 pixels. If not provided, we will use a picture of the submitted poster for the website. If your drawing requires special printing because of size, resolution, or color constraints, you are encouraged to submit via hard-copy to the address below. In this case, please contact us in advance and make sure that your submission is received no later than September 15. Please still submit the remaining items via EasyChair.